Another World (1996) and Days of our Lives (2001). 1939: On Bachelor's Children, Sam (Olan Soule) was relieved to learn that Janet had safely given birth to a healthy child after a grueling, perilous labor. Sam's relief was so great that he appeared to be in shock and could only respond to questions with grunts and murmurs. Janet was exhausted but ecstatically happy, and moved by the fact that her baby daughter's Christmas morning birth was accompanied by caroling from a nearby church. 1967: On The Doctors, Matt Powers (James Pritchett) talked the Hope Memorial janitor, Sam Kringle (Paul Price), into playing Santa Claus instead of him. 1973: On Days of our Lives, "Marty Hanson" aka Mickey Horton (John Clarke) and Maggie Simmons (Suzanne Rogers) shared their first Christmas together. 1973: On As the World Turns, Jennifer Hughes (Gillian Spencer) gave birth to a baby girl, Frannie. 1974: On The Edge of Night, the citizens of Monticello celebrated Christmas, and Danny Micelli (Lou Criscuolo) continued to mourn his beloved wife Babs. 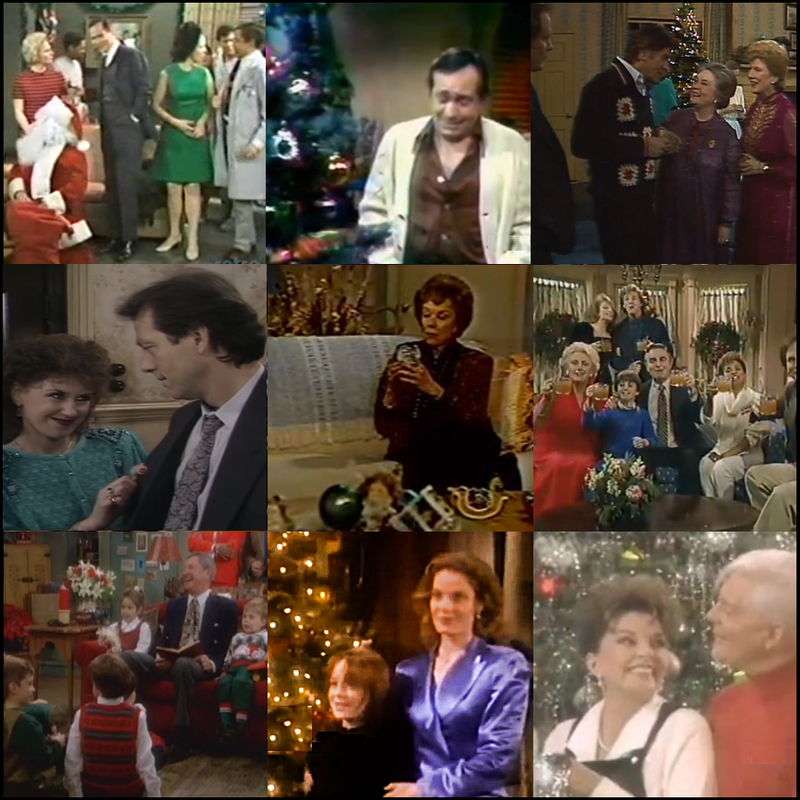 1979: On All My Children, Ruth Martin (Mary Fickett) gave birth to a baby boy, Joseph "Jake" Henry Martin, Jr.
1980: On Guiding Light, Alan Spaulding (Christopher Bernau) surprised his wife, Hope (Elvera Roussel), by taking her back to the island they fell in love while stranded on a year earlier. Later, the annual Cedars Christmas story and a gathering at Bert Bauer's house where her son, Mike (Don Stewart), sang. 1981: On The Doctors, the citizens of Madison celebrated Christmas, and rallied around Luke Dancy (Frank Telfer) in the hospital. 1981: On General Hospital, Luke (Anthony Geary), Tiffany (Sharon Wyatt) and more performed for the children at the hospital. 1984: ABC aired the final episode of primetime soap opera Paper Dolls. 1985: On Another World, Jake McKinnon (Tom Eplin) gave Marley Love (Ellen Wheeler) an engagement ring. 1986: On Search for Tomorrow, Joanne Tourneur (Mary Stuart) worried her Christmas dreams would not come true. 1986: On All My Children, Palmer Cortlandt (James Mitchell) proposed to his ex-wife, Daisy (Gillian Spencer). 1996: On Another World, Ryan Harrison's (Paul Michael Valley) ghost continued to watch over Vicky Hudson (Jensen Buchanan). Laura Moss and Lindsay Lohan debuted in the roles of Amanda Cory and Alli Fowler. 2006: On EastEnders, Pauline Fowler (Wendy Richards) dropped dead in Albert Square gardens, but how or why she died was not immediately clear and would lead to a "Who Killed Pauline Fowler?" story. Richards had been an original cast member since the show's debut in 1985. Per the Daily Mail, this Christmas Day episode was the second most watched program of the day on British television with an estimated 10.7 million viewers.